We traveled to the East Coast in October 1970 to visit our son, Ray and his family in Newark, Delaware. From there, Ray and Mary took us on an auto tour of the bright New England fall colors and to Maine for some genealogy exploring. On October 15, in Newington Parish, we visited the Town Hall which also houses the Fire Department. Farther down the road we stopped at the little white church with it's large grave yard. A sign told us it was built in 1699, the oldest Congregational Church in America, still in continuous use. We could not enter, but it was well cared for, nicely painted and looked as if it were used every week. An old slab-like stone with a face carved and inscription reading, "This tomb built in the year 1739 by John Downing, Junior. He then aged 86 years" was leaning against one corner of the church. Marion L. Dunn in his "Record of the Quint Family", state that "the Parish of Newington was set off from Dover and Portsmouth. That portion of Dover lying south of the Piscataqua River and east of the Great Bay, and a portion of Portsmouth adjoining the eastern and southern boundaries of this district. At a meeting of the inhabitants of this section, convened January 21, 1712 at the meeting-house, which had already been erected although it was not finished, to confer about having a minister among them. It was then decided to take immediate action towards forming a separate parish. It was signed by many names and among them were the names of John Quint and his father-in-law Thomas Rowe." "John Quint is credited with building the church of which they speak. That church, (which we took a photo of on October 15, 1970), is still in use and is the oldest Congregational Church in continuous use in the United States." From the above record, we conclude the church was built in 1699 by our ancestor, John Quint; was used as a Meeting House and by itinerant ministers until 1712 when it was finished and a resident minister obtained. We went along the roadway on the north side of the graveyard to the west gate. Entering this gate went south for about 50 yards and on the right side of this lane are the graves of six of the Quint family. These graves were originally on the Quint farm, but because of highway construction, were moved into the church graveyard. We photographed the head stones. The graves are Joseph Quint (Thomas, Thomas, John) b. 1788 Newington, NH, died 13 June 1858, Newington. His wife, Elizabeth A. Quint, b. 1791, died 19 March 1851, age 60 years. Also three of their children, Clarissa, d. 4 June, 1857, age 38 years, 2 months, 12 days; Temperance, d. 29 November 1852 age 25 years; and John A. W. Quint, born 1823, died 12 June 1856, age 33 years, 5 months. Many generations of Quints lived in Newington Parish and neighboring village of Greenland and the city of Portsmouth, NH. Our branch of the Quint family are found at Berwick, Maine in the early 1750's; at Sanford, Maine in 1788; and at Gilman Pond Settlement in summer of 1810. 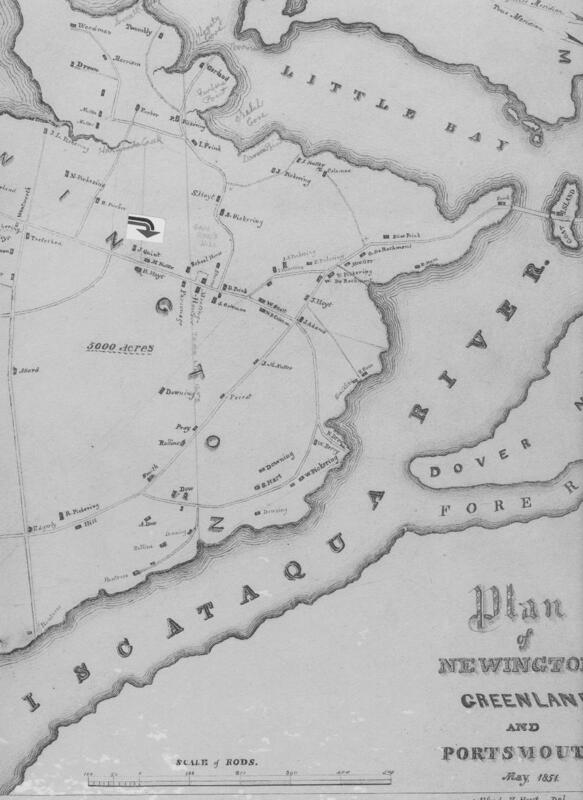 Map of Newington in 1851 shows J. Quint living nearby.